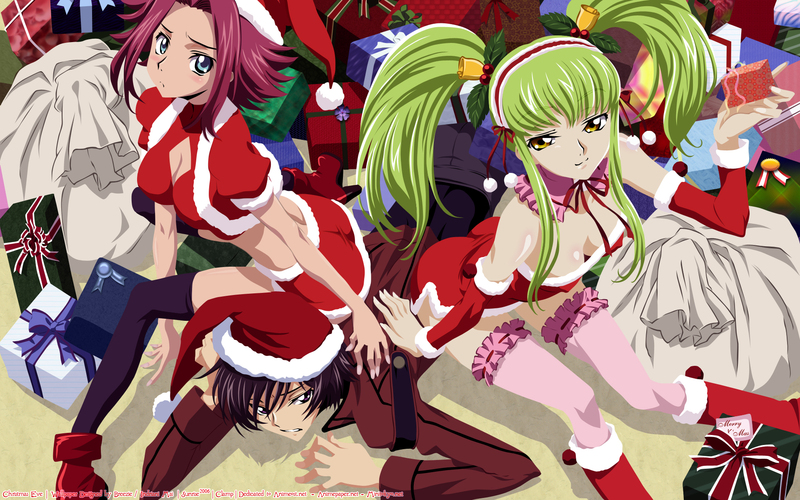 Here's a gift from me: A Code Geass wallpaper! The noob me shed bloody tears to finish this piece, though. Sometimes you browse around and find something incredible. Really amazing work! It's really a nice work. But I also must say,that in two weeks you are the third who maked the same scan. The first one was Chiaki and I think his is a little better. GOD bless you and enjoy the rest of the holidays. Great details, Just in time for Christmas! This vector is very awesome!I like it! If it was the old CLAMP style *i.e. CCS*, you'll not just shed blood. I feel sorry for Lelouch. So Cute! I really like it. Omg this is one of the coolest x-mas theme images I've seen! This is a very nice piece. The art style is highly appealing because to me, and not in a bad way, it seems different than most. The main points where I notice this are in the girl's faces and hair. It's different, but that doesn't mean it's bad. Good Job.